Ping-Pong balls are about perfect for most small turtles. They seem to be attracted to the white color—maybe the Ping-Pong ball looks like a turtle egg to them. As always, practice during a time of day when your turtle is active and hungry. Start by placing the ball in front of your turtle. Wait for him to investigate it, and then click and treat. It doesn’t matter if he touches the ball with his nose or his foot—there are no ofﬁcial rules for turtle soccer! Repeat several times. The next step is to reinforce your turtle only if he hits the ball hard enough to move it. Repeat until he is consistently moving the ball when he touches it. Some turtles really get into this game and go nuts whacking the ball around. It can be a lot of fun! Get some treats that your turtle loves. Pick a time of day for training when he is active and hungry. Go to a spot where he is comfortable and relaxed. If his head and/or legs are pulled into his shell, he probably isn’t happy! Remember that you are going to have to be patient with your turtle. Make sure you have plenty of time to train before starting. Start with a quick review of the clicker. When he hears a click, he should look to your hand for a treat. 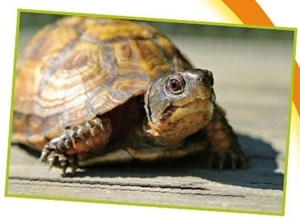 Some turtles like to work for touch, and if that’s what yours likes, just pet or stroke him instead of giving a treat. Now place your free hand (the one that’s not holding the treat) a few inches away, with your palm facing toward your turtle. Wait for him to move a front foot to step closer to your hand. When he does, click and treat. You don’t need a big motion just yet—lifting his foot just a little will do. Repeat until he is consistently raising his foot to come to you to get a treat. The next step is to click only if he touches your hand with his foot. Be patient! Also be sure that your hand is close enough for him to reach it. Repeat until he is reliably hitting your hand with his foot. Remember to thoroughly wash your hands whenever you handle your turtle, because reptiles can carry germs that may make people very sick. And please, never pick up a wild turtle and try to keep him as a pet. It’s cruel to the turtle— and illegal!